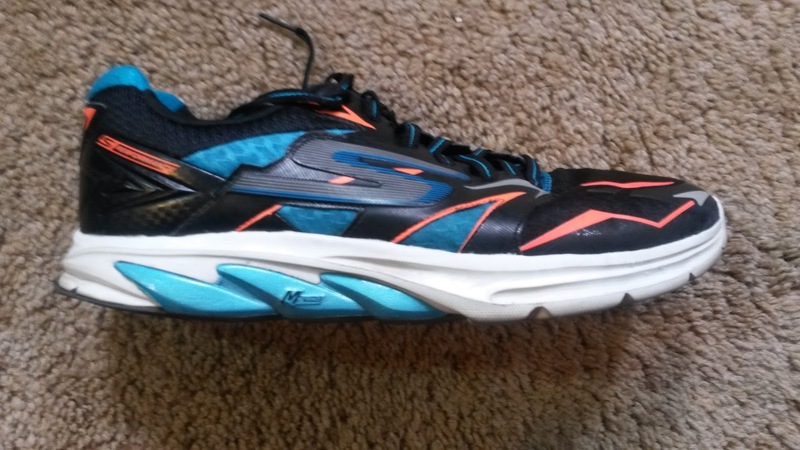 Sole/Ride/Drop: Skechers performance shoes generally use a material called Resalyte, which with first step in feels fairly soft. I was concerned that this would make the ride unstable, but that has not been the case. Combined with the specific placements of durable outsole rubber and once the shoe breaks in after a few miles, the ride becomes both protective and responsive. There is a considerable amount of shoe between your foot and the ground, so do not expect an amazing ground feel. The Skechers GoRun Strada is clearly a training shoe in line with the Nike Pegasus, Saucony Ride, Brooks Launch, etc. That being said, the GoRun Strada runs similar to the Launch 2, Sayonara 3 and other semi-lightweight trainers due to the more responsive feel. The drop is listed at 8mm and that is approximately what it feels like. I would place it in the 8-10mm range but that is splitting hairs. 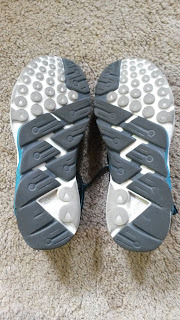 The midsole does compress quite bit so it may feel lower depending on how much pressure you apply through the heel at loading response and midstance (ie acceptance of weight or landing and when your foot is in contact with the ground under your body). 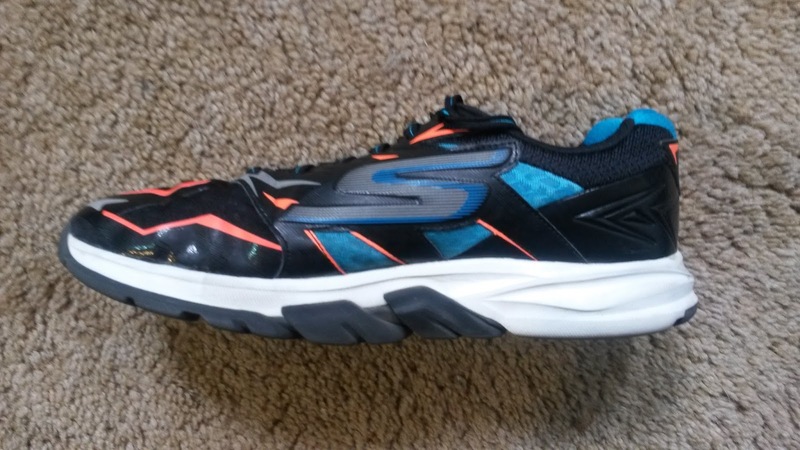 Fit/Feel/Upper: The upper is pretty heavy on this shoe compared to other Skechers Performance offerings, but it is definitely durable. There is a good fit through the forefoot with plenty of room without being sloppy. The heel is a bit wide but can be easily fixed with lacing techniques. The is a very mild and flexible heel counter that does a great job of holding your heel in place without being too stiff or cumbersome. I have not had any slippage issues with this shoe nor any major tears or loose threads. The Strada's upper is not the most breathable out there, but it does not get too hot. As with most Skecher's Performance shoes, the Strada can be worn sockless without much issue. I have tried this a few times but due to the shoe fitting a 1/8-1/4 size big (I'm just nit picking) I tend to wear socks. I was initially concerned about the slightly larger fit, but as I mentioned earlier I have not had any slipping issues and do not feel the shoe is long while I'm running. So if you are between sizes you could attempt a 1/2 size down but I would not wear socks. Personally I would stick to your normal size. 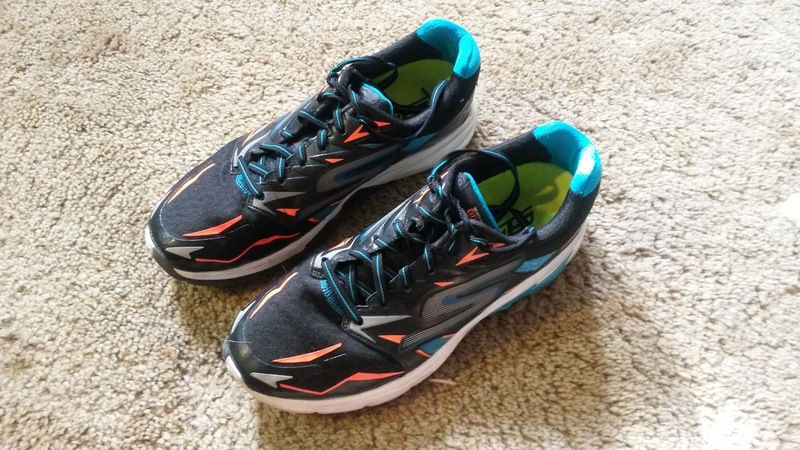 Weight/Responsiveness: Despite being a +10 ounce training shoe, the GoRun Strada feels much lighter due to the responsiveness of the foam I mentioned earlier. I very much like the new Resalyte bounce, I just wish it was a bit more durable. I have a little over 170 miles on the and the lateral heel already has extensive wear. 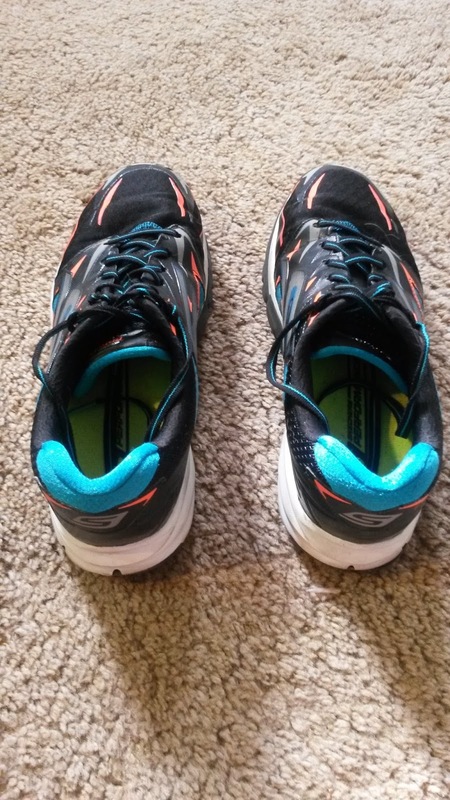 I plan to retire them around 200 miles not because the cushioning is any less but because my body tends to be sensitive to shoes when they have excessive wear patterns in them. If you are light on your feet this will be a great shoe for you. However, if you tend to chew through outsoles, then I would approach this shoe with caution. Luckily they can be found for as low as $60 in some places, so the price and wear somewhat even out. I hope this issue will be addressed in the second version, because for $130 MSRP I expect many more miles out of a shoe. Other than the durability issue, this is a great responsive trainer. I have not used this shoe for my faster workouts (I save those for racing flats) but have had fast runs and long runs in this shoe. Once you get going, this shoe has some bounce and it feels very good to run fast. Based on the weight and size of this shoe, the GoRun Strada is still a training shoe that should be used for longer miles and maybe a tempo run at most. Thoughts as a DPT (Student): There are some interesting aspects of the GoRun Strada that my inner physical therapist picked up on. As mentioned earlier, I am very happy with the slightly more anatomic foot shape in the forefoot (hopefully the heel fit will be improved in the next version). I feel that the upper in a trainer should secure the foot but should be a bit on the wider side. Racing flats should secure the foot very well and can be a bit narrower. That is just my personal opinion. I thought I would hate the M-Strike but have found that it creates a smooth ride and gives good feedback on foot placement. The mild curved heel makes the ride even more smooth and natural (I have discussed the importance of a curved heel previously). The most interesting thing that stuck out to me was the placement of the more durable outsole foam compared to the softer foam. Because of the full midfoot covering and medial forefoot covering, I feel that the GoRun Strada actually has some mild forefoot stability. There are many ways to introduce stability as I mentioned earlier. The wider base of the Strada already makes the shoe more stable and the more firm medial forefoot rubber compared to the softer lateral exposed midsole material gives it a semi posted structure. It is not aggressive posting but it definitely contributes to making the ride more stable naturally without aggressively forcing the foot to do anything. I would call the GoRun Strada a Neutral Plus shoe given the natural stability elements in the forefoot. I really wish more companies would introduce shoes with forefoot posting. As a physical therapist, I do believe the priority should be improving biomechanics through strength, flexibility and motor control, but the majority of the population will not spend the time to do that. Additionally, not everyone has excessive mobility and lack of strength in the posterior heel or midfoot. The forefoot is an area that has been untouched in terms of stability in the US in recent years. There are a few racing flats in the Asian market (such as the Asics Tartherzeal TS 3) that do have medial forefoot posting, but that is about it. Definitely an untapped area of the running market. Conclusion: I am extremely impressed with the Skechers GoRun Strada and Skechers Performance. They created a shoe that I was apprehensive about but learned to love very quickly. I still believe the durability needs a considerable amount of work, but Skechers Performance is no longer in the development phase of being a legitimate running company. They are putting out awesome shoes that feel like finished products. The Strada is a great contender in the Neutral shoe category and I would not hesitate to recommend that individuals wearing that type of shoe consider it along with the other industry leaders from Nike, Saucony, Brooks, etc. I am looking forward to getting my hands on the Skechers GoMeb Speed for longer racing and hope to see Skechers come out with a 5k racing flat or spike in the near future (the running shoe geeks out there will be aware that Kara Goucher was seen at the Portland Track Festival with Skechers Track Spikes that looked very similar to the Nike Matumbo spike). I have high hopes for this company and given that I am so close to them (both of us are in Los Angeles right now), I wouldn't mind stopping by to learn from them!!! These shoes were a provided for free after placing 3rd in the 2015 Santa Monica Classic 10k by Skechers Performance and the LA Marathon. I put at least 100 miles on every pair of shoes before I review them (except racing flats which I put on at least 50 miles). Currently I have 177 miles on my first pair.